I get a lot of questions about transportation in Istanbul. Many people seem to tend towards engaging a chauffeured vehicle, or manipulated towards this choice. While I have no objection to the comfort of exploring Istanbul in your private vehicle driven by a driver, but I must also say that this may not be the optimum solution. If you stay in a part of city not served by tram / metro or public ferry, optimum solution is engaging a private vehicle. But, if you are walking distance to one of the former listed public transport vehicles, I suggest you use it effectively. Notice that I am not listing public bus, as in very clogged traffic and numerous stops it makes, public bus is not an ideal option. Get a taxi instead! It will still be trapped in crowded traffic but won’t be making the frequent stops as the bus and you can sit down in it! Istanbul’s public transportation is served with the smart Istanbulkart which works in every public vehicle, metro, tram, funicular, bus and ferry. You can buy an Istanbulkart at any main public transport station. Fee is 6 TL per card, this roughly corresponds to 2.5 USD today. Istanbulkart helps you save approximately 40% for each ride. The card price of 6 TL doesn’t provide any credits. While you are buying the Istanbulkart, you can buy credits, or you can buy them from a vending machine located at stations. It is very easy to use the vending machine. Just watch the following short video. Turnstiles are equipped with magnetic readers, you need to approach your card by about 2 inches to the reader to pass thru. You will notice that most locals just prefer to put the card on the reader instead of trying to figure out if it is close enough or not. You can see how it works in the following video. Public transport is fun, easy and fast, but very crowded at rush hours, it is not unusual to see people shoulder to shoulder. 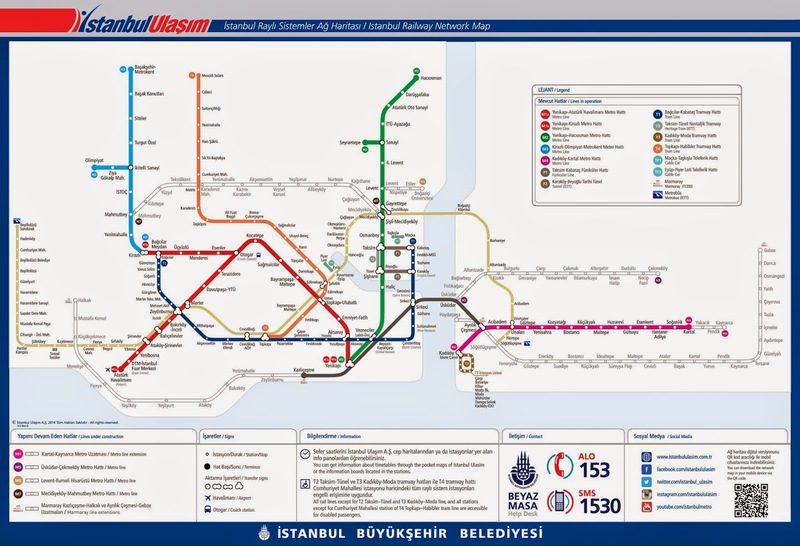 If you are arriving Istanbul on a cruise ship you can easily benefit the nearby tram line. There are two ports on the Bosphorus that the cruise ships dock, they are in Karakoy and Salı Pazarı. They are short walk to Tophane and Karaköy tram stations. Tram line is T1, providing an easy ride to heart of Old Town. Stop at the heart of Old Town is named Sultanahmet (Blue Mosque). The key for a fun visit in Istanbul is to choose a smart location. For tips on “Where to Stay in Istanbul?” see entry dated December 15. I wish a Merry Christmas and a Happy New year to all travelers.